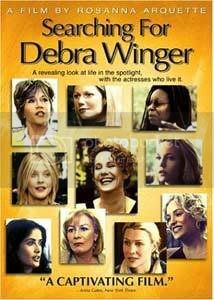 It's been out for about five years or so, but I just saw Searching for Debra Winger and wanted to recommend it. In it, Rosana Arquette (who I have loved ever since Desperately Seeking Susan) talks with tons of amazing and talented actresses about the unique challenges they face being aging females in Hollywood. Trying to figure out how they balance their careers with partnerships or motherhood, finding well-written characters to play, and keeping sane in the business are topics that are addressed, but the thing I found most interesting about this documentary film is how much the women really respect and admire each other, finding inspiration and strength in what they see in other actresses. Each woman spoke with such eloquence and wisdom about what it is like to be female in today's movie and television industry, and even though they didn't used the word "feminist" to describe themselves and their attitudes, this whole project was bursting with feminism.